(Newser) – A young boy was hospitalized with unknown injuries after falling off an 80-year-old wooden roller coaster Thursday at Pennsylvania's Idlewild & Soak Zone, NBC News reports. The boy hasn't been identified, but he may have been around 3 years old. 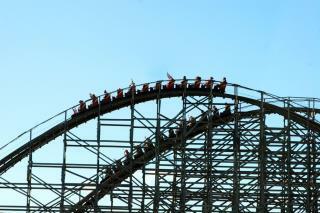 According to KDKA, the boy was riding the Rollo Coaster with his brother when he fell. It's unclear how far the boy fell, though a spokesperson for the amusement park says the fall happened in the "middle part" of the ride, WTAE reports. No kids on coasters, period unless its like the small carnival models that make like a 20 second loop. FYI, there is no safety harness/restraint on this ride. Just a bar that you hold onto (if necessary). And it pretty much is a kiddie coaster: https://www.youtube.com/watch?v=DfY5mforpdU (You even see some older children ride it hands-off with their arms raised) Here's an FPV: https://www.youtube.com/watch?v=7Wz-mFj5oIM And another FPV, but showing more little kiddies riding in the beginning: https://www.youtube.com/watch?v=uD0xmX7dlwA I wonder whether the height requirement was met or not. Even so, at certain ages, the kid should be with an adult, not with a sibling, as this kid was. The Newser story and its source links don't mention how old his brother is. Actually it's a requirement to be with an adult for riders under 48 inches in height, so I wonder if the operator should be blamed. My aunt and uncle live real close to Ligonier and I went to Idlewild several times with my siblings and cousins (and the adults) when visiting them while growing up, and I'm very familiar with the ride. Although it must have been over 30 years since I was last at the park (before Kennywood bought it), I can't imagine the ride itself has changed any. Why in all Hades was a 3yo on that ride? UM Whom to blame? PARENTS & RIDE OPERATOR! Both should be charged! Don't say not the operator because unless he was blind and drunk and high and insane and dead he/she would not let a toddler on a ride like this!